Welcome to Capital Moves Two, our stunning Golf Vacation rental home, close to Disney (15 mins) and all that Orlando has to offer. The villas has 2,046 Sq. Ft of living space, and features 4 large bedrooms including Two Master suites, which include luxurious Master Bathrooms with his and hers sinks, a large shower cubicle. Our home is south facing and has a private heated swimming pool & deck, backing onto a natural conservation area. 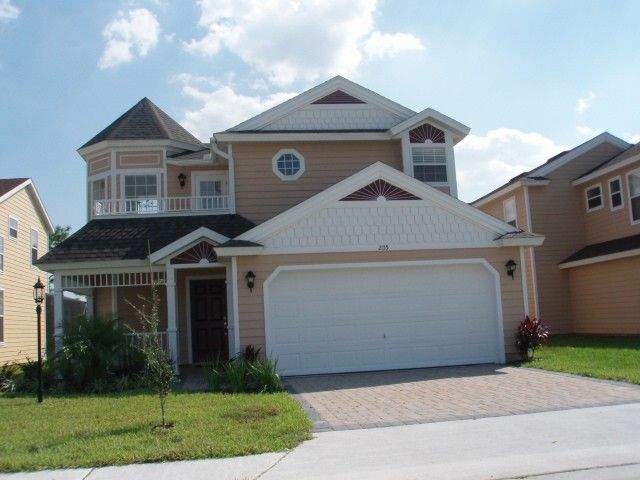 Our beautiful rental home is located at the exclusive Golf and Country Club Resort of Providence in Orlando, Florida. This luxurious Golf & Country Club Resort, with a championship golf course desinged by Mike Dasher, is one of the leading Golfing Resorts in the area, with Resort amenities that are second to none. Capital Moves Two - Home Amenities at a Glance: Foyer with a magnificent curved staircase. • Great Room with its impressive vaulted ceiling. • Luxurious fully fitted Kitchen and adjacent Dining Room. • Pool and Deck. • The Master Bedroom which includes a luxurious Master Bathroom with his and hers sinks, a large shower cubicle. • From the Loft, you also have access to the front Outside Balcony where you can view the Championship Golf Course situated across the road from Victoria Woods. • Two of the Bedrooms share the third Bathroom. • The fourth bedroom is a magnificent Second Master Bedroom with en-suite bathroom. Golf Information: For Golf enthusiasts you’re really in for a treat as our stunning vacation home is just a short stroll away from the magnificent Golf Clubhouse with pro shop, restaurant & lounge. From here pick up your Golf Cart & Clubs for that all important leisurely game of golf at the award winning Michael Dasher 18 hole par 72 golf course. The Golf course includes 7,046 yards of championship tees, driving range & putting green all maintained to the highest standards. The house was very spacious in a super community. The house was clean and we were able to do meals and laundry which made life alot easier. Thanks. We had a lovely holiday in this villa. The communication between the owner and us was very quick and helpful before we left. While we were staying in the villa if we had any issues they were dealt with very quickly and in a friendly manner by Kim in the property's management company. The villa is on a 24 hour manned gated community which made the stay feel very safe. The providence is a beautiful estate which is located near to the i4 and there are supermarkets and shops close by. The villa is of a generous size with a good layout, the villa is well equipped by some of the kitchen utensils should be replaced, plates and cups with chips in them. Literally a 1 minute drive from the clubhouse. We went off-season so didn't need the house membership (we got a good group rate from the golf club), but the house membership would be a big saver during other times of the year. House is spacious, comfortable and the pool felt great after each long day of golf in the heat. Patio/pool area was excellent and we also used the deck/porch area in the front of the house on second floor to watch a sunset or two. Nice, quiet neighborhood and the golf course personnel were excellent and friendly. We had a great week. Great place to relax and unwind. We really enjoyed the week. The house and golf course were great. The house was great, very clean and great location . Close to two publix, 2 minutes from an amazing golf course, top shape, and sudsidized golf at 35.00 amazing vacation. We are returning next year for a month. Our luxurious Home is situated at Providence Golf and Country Club Resort, Orlando, Florida. Set amidst the stunning golf course, with an array of widlife that has to be seen to be believed. The resort is just 12 minutes to Central Florida's main attraction, Walt Disney World. This luxury resort in Orlando, Florida has become one of the leading Golfing resorts of the Orlando area. Our Orlando vacation rental home is just 25 minutes from Orlando International Airport, and offers easy access to Orlando’s famous attractions. Driving Directions from Orlando airports: Take I-4 west to exit 58 (the Reunion/Champions Gate exit) and make a left turn. Go to Hwy 17 - 92 and turn right. Follow this a few miles to the beautiful gated entrance of Providence Golf and Country Club Resort, which is on your left hand side. Golf: For Golf enthusiasts you’re really in for a treat as our stunning vacation home is just a short stroll away from the magnificent Golf Clubhouse with pro shop, restaurant & lounge. From here pick up your Golf Cart & Clubs for that all important leisurely game of golf at the award winning Michael Dasher 18 hole par 72 golf course. The Golf course includes 7,046 yards of championship tees, driving range & putting green all maintained to the highest standards. Your stay at our home includes subsidised Golf and membership privileges - what more could you ask for! The Prices are per week and are fully Inclusive. NB: Prices may be subject to change at the owner's discretion. Occasionally we have late availability due to cancellations, please contact us for these Special offers. £100 per week non refundable deposit is required at the time of booking. Balance is due 10 weeks before arrival.